The story of the founding of our parish began with a small group of people at a historic meeting in the home of Anthony Susen in 1911. We have followed the fulfillment of their dreams through decades of faith in Christ. Through these faithful witnesses and those who have followed we have learned that the true wealth of a parish lies in its people. We have captured with photographs and in writing some of the significant parts of history. What we cannot capture is the spirit of the parish and the fully cooperative effort between our priests and the people. During the mid-nineteenth century the small town of Pennyville, later to be named Park Ridge, was beginning to develop. The Catholic community grew slowly and in 1894 the New World newspaper reported that, "a small Catholic Community has established itself at Park Ridge and Mass is being celebrated there occasionally." The nearest Catholic church was then St. Mary's in Des Plaines. In 1901, the Daughters of Charity opened a summer house in Park Ridge for the children from St. Vincent's Orphanage in Chicago, and Catholics in the area attended Mass in the Sister's Chapel there. In 1904, Park Ridge became part of the newly organized parish of Immaculate Conception in Norwood Park. By 1911, however, Park Ridge numbered some 1,700 inhabitants and many were Catholic. It became apparent as the numbers increased that a church was needed for her people. Archbishop James C. Quigley authorized the formation of a parish and he placed it under the direction of Reverend Augustine Scannel, C.P. On June 20, 1911, pioneering members of our parish held a meeting at the home of Anthony Susen to discuss the building of the new church, which was to be named St. Paul of the Cross in honor of the saint who founded the Passionist Order. Not only did Mr. Susen donate the six acres of land for the site of the Church, he also contributed $500.00 in cash to the building fund. Michael Schiessle, Silas B. Carpenter and others added their support and St. Paul of the Cross was launched. On June 25, 1911, Mass was celebrated in the old Globe Music Hall (also known as Robinson's Hall) on Prospect avenue. It was later destroyed by fire. Construction of the church continued into 1912 and on June 23, 1912, the white frame church of St. Paul of the Cross with a seating capacity for 350 people was dedicated by Bishop Alexander J. McGavick. The cost of the Church was $74,000. Four years later at the request of the Passionist Fathers, the church was turned over to the care of the Diocesan priests and the Reverend John H. Nawn was named pastor in July 1916. He served St. Paul of the Cross until April 1922 when he was named Pastor of St. Francis Xavier parish in LaGrange. Father Francis M.C. Smith was named his successor and remained pastor of St. Paul of the Cross for the next 34 years. Between 1920 and 1930, Park Ridge experienced a building boom and its population increased from 2,500 to 10,400 persons. Under Fr. Smith's leadership, construction began on a school, the cornerstone of which was laid on July 31, 1924, and the Sisters of Mercy opened the doors of St. Paul of the Cross school in January 25, 1925, with an enrollment of 85 students. The Catholic population in Park Ridge remained in the minority for many years. In "A History of Park Ridge", O.F. Jordan relates that the Ku Klux Klan attempted "to rout the Catholics." It would seem safe to say however, that St. Paul of the Cross survived and prospered and in 1936 the twenty-fifth anniversary of the founding of the parish was celebrated. "It was the best of times, it was the worst of times." Charles Dickens' words could very easily be applied to the next chapter of our parish history. The effects of the Great Depression which began in 1929 continued into the next decade. There was massive unemployment throughout the nation, accompanied by bread lines, soup kitchens and almost total despair. People relied heavily on their faith and each other to help them through those bleak days. The parish community helped wherever possible; those more fortunate helped the ones in need. Fr. Francis Smith provided food and clothing for many and is said to have saved the home of one large family from foreclosure by paying the $9.50 in arrears. In 1941 the national financial crisis ended when the United States entered World War II after the attack on Pearl Harbor. Those were surely the "worst of times." Throughout the dark days of fear and uncertainty, Fr. Smith shepherded his flock with love and compassion, praying with and consoling the grieving families whose loved ones were missing or killed in action. He kept up the morale of the parishioners, who once again were finding the support and comfort they needed in their faith and their community. The war ended in August 1945 and the nation experienced a tremendous economic boom. Park Ridge grew rapidly during this post-war period and by 1950 the population had grown to 16,500, many of whom were Catholic. The small frame church quickly became overcrowded and additional Masses were held in the lower level of the school. A fund drive was inaugurated by Fr. Smith for a new church and school addition. Fr. Augustine Scannell, who had begun the work of organizing St. Paul of the Cross parish in 1911, officiated at the ground breaking ceremony on June 24, 1951. He was also present for the laying of the cornerstone on March 2, 1952. The white frame church on Northwest Highway which had served the parish for over forty years, once described as "the neatest house of God in Northwest Chicago" was retired on September 6, 1953, when Samuel Cardinal Stritch dedicated the new church. Many of the parishioners at that time were second and third generations of the original pioneer families of St. Paul of the Cross, and the same love and pride with which their parents and grandparents built the original church was apparent in its replacement. Only the finest of materials were used for the construction and decoration of the new house of worship, said to be one of the loveliest churches in the archdiocese of Chicago. Designed by architects Barry and Kay in Romanesque style, the exterior is of red face brick with gray stone trim and has the traditional tile roof of the period. The finest marble was imported from Italy for the magnificent main altar. White marble statues of Our Lady and St. Joseph dominate the two side altars. The stained glass windows depicting historical scriptural events and symbols of the saints are described in a separate section. (See Stained Glass Windows) The Stations of the Cross, painted in oils, are replicas of those hanging in the Chapel of the Immaculate Conception at St. Mary of the Lake Seminary in Mundelein. Finely carved oak panels line the interior walls of the church and match the solid oak pews which seat approximately 900 people. The building cost approximately $900,000. Various organizations including the Altar and Rosary Society (now known as the Apostolate of Women) worked hard to raise funds for the new church and its artifacts. Many individual benefactors donated generously, often in memory of family members. Despite the generosity of the parish, however, there remained a huge debt to be reduced and fund raising would continue to be a major priority for some time to come. The numbers of Catholic families continued to grow at a phenomenal rate and in 1956, a new parish was created under the leadership of Fr. Edward Dowling, then an assistant to Fr. Smith. The church to serve the Catholics in south Park Ridge was named Mary, Seat of Wisdom. St. Juliana parish had been established for the Catholics of Edison Park, formerly a part of St. Paul of the Cross some thirty years earlier. During this period of rapid growth, it became necessary to add to the school. Four rooms were added on in 1950 and four more again in 1955. In 1956, the present rectory was completed, replacing the rather dilapidated small frame house on Northwest highway which had served as the priests' residence since the beginning of the parish. On October 16, 1956, Father Francis Smith died at the age of 74. The parish was deeply saddened at the loss of the man who had been their pastor and friend for 34 years. Throughout the "best of times and the worst of times" he had shepherded his flock, seeing the Baptisms, Reconciliations, First Communions, Confirmations, Weddings and Anointings of the Sick (known as Last Rites in those days) for many. The church, rectory, school and convent are fitting memorials to his dedicated service. It was the end of an era. No other pastor would remain at St. Paul of the Cross for that length of time again. The Right Reverend Monsignor Duffin was appointed pastor in November 1956. In the years between 1956 and 1960, Park Ridge increased from 22,000 to 32,569 persons. The year 1960 saw the organization of another parish, Our Lady of Ransom, established in Niles to serve sections of Park Ridge, Niles and Des Plaines. The parish of St. Paul of the Cross suffered only a temporary decline in membership as the result of the formation of this new parish. Before long, the Catholic community in north Park Ridge was again on the increase. It is interesting to note that during the years of the phenomenal population expansion, three new parishes were formed: St. Juliana, Mary Seat of Wisdom and Our Lady of Ransom. It was now apparent that better quarters were needed for the 983 children enrolled in the parish school. Monsignor Duffin headed a fund drive for a school addition. The new structure known as the Junior High School building was dedicated on April 16, 1961, by which time the school enrollment was at an all time high with almost 1,200 children in attendance. The day of the dedication of the new building held special meaning for the members of St. Paul of the Cross parish as it marked a 50th anniversary, or Golden Jubilee, of the founding of the parish. His Eminence Albert Cardinal Meyer, Archbishop of Chicago presided at the Solemn Mass of Thanksgiving. The Celebrant was Fr. Augustine Scannell, C.P., founder of the parish 50 years before and now 82 years old. A gala celebration was held on April 22, 1961, at the Sheraton Towers. The parish had much to be thankful for and celebrate. From its humble beginnings in the tiny white frame church with approximately 50 or so families, the parish had grown to a membership numbering in the thousands. In Cardinal Meyer's words it had become, "One of the finest parishes in the suburban areas of Chicago." This was a fitting tribute to the founding members of St. Paul of the Cross parish and the people who had continued in the same tradition, the sacrifice and dedication that made possible this Sanctuary of the Lord and all that it signifies. The years between 1961 and 1986 were full and eventful ones, not only at St. Paul of the Cross, but in the entire Catholic Church. On December 25, 1961, Pope John XXIII officially convoked the 2nd Vatican Council. The Council then opened on October 11, 1962, in St. Peter's Basilica in Rome and was divided into four parts. The fourth and final period was officially concluded in December, 1965. The primary reason for the Council was to bring up to date the Code of Canon Law. The changes resulting from the Council were many and varied and the impact would be felt throughout the world for many years to come. These changes were implemented over a period of several years; it was a time of both renewal and shock in the Church and the transition was not always smooth. Many Catholics were alienated by these changes. It seemed to them that the very roots of their existence and those of their forefathers were being torn up and cast aside. Today, almost a quarter of a century after the Council was convened, the Church is dynamic, exciting and still growing, largely because of the contributions of Vatican II. The most dramatic changes to be felt by the laity were the visible ones, the changes in the Liturgy. The Mass would be celebrated with the priest facing the people at a simple altar table and the language of the Country would replace Latin. The rites for Baptism, Marriage and Funerals would be changed and much more emphasis would be placed on participation by the congregation. Pastors were instructed to follow certain directives that would involve the faithful in both lay ministry and parish administration. At St. Paul of the Cross, probably the first visible change was the placing of a new Altar of Sacrifice in the Sanctuary in front of the high Altar. There, on a simple table of marble, Mass was celebrated with the priest facing the people. Other improvements were necessary in the parish plant. The old school building was renovated and fireproofed. The church had air conditioning installed and a new Convent was constructed on Ridge Terrace. In 1968, Monsignor Duffin organized a School Board to formulate policies governing the operation of the parish school, thus beginning the involvement of the Laity. In 1969, Monsignor Duffin suffered several heart attacks which required him to be hospitalized. Help was needed and in the spring of 1970, Cardinal Cody appointed Monsignor Donald J. Masterson as administrator. Shortly after his arrival, Monsignor directed a program of repair and renovation. The continued growth of the parish had made major repairs necessary in the heavily used buildings. These renovations and repairs added substantially to the parish debt. 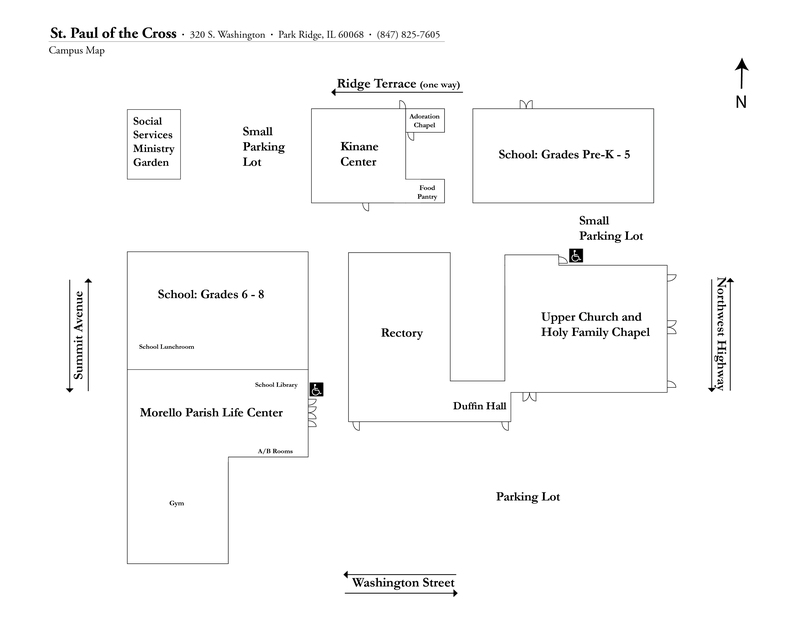 A parish crisis occurred early in 1971 when the Sisters of Mercy announced that, due to a decline in their membership, nuns of that order would no longer be assigned to St. Paul of the Cross school. The decision to keep the school operating with lay teachers was a sound one. Once the school problem was resolved, parish finances became an issue. Additional revenue was needed to pay for building repairs and to meet the increased cost of operating the school with an all lay faculty. A door-to-door canvass of parishioners was made by teams of volunteers who explained the need for substantial increases in the Sunday offertory collections. Once more, the people of St. Paul of the Cross rose to the occasion, making personal sacrifices to help the church meet these new demands and slowly, but surely, the large debt was reduced. Although Monsignor Duffin returned to parish work, his health continued to decline. In August 1971 he was named pastor Emeritus and Monsignor Masterson was appointed Pastor. Monsignor Duffin died on June 1, 1974, at the age of 71 after many years of faithful service. Religious education continued to be a high priority in the parish, as it still is today. As more children enrolled in public schools, the need for an organized Confraternity of Christian Doctrine (CCD) became necessary. In 1970, a formal CCD program was started. One of the most important challenges facing the pastor and his associates was the spiritual leadership of the parishioners. This was a monumental task in a parish that had grown to 2,100 families in the mid-seventies. St. Paul of the Cross, however, had been blessed over the years with a long line of hard-working, dedicated associate pastors, each of whom contributed enormously to the spirit and growth of the parish. In 1977, the parish was fortunate to receive its first permanent Deacon when parishioner Mr. Aloysius Memmel was ordained. Not very many parishes can boast of the removal and replacement of a street, but St. Paul of the Cross can add that, too, to its list of accomplishments. When it became known that a large office complex was to be built next to St. Paul of the Cross and that Euclid Avenue would be closed to traffic, the safety of the school children became a great concern because of the anticipated increase in traffic volume. In the fall of 1982, the parish applied to the City of Park Ridge for permission to move Washington Street further east so that the parking lot could be expanded and made contiguous to the rectory. After several months of negotiations and hearings by the City Council, permission was granted. The end result was a safer playground for the children and additional parking for parishioners. Monsignor Masterson was the moving force behind the project and it was because of his concern for the safety of the children that this enormous task was undertaken. It was to be his last project for the parish. Early in 1983, he underwent heart surgery which left him in frail health. The parish was shocked and saddened by his death in September of that year. On April 13, 1986, a small group of parishioners walked proudly up the aisle of St. Paul of the Cross in procession with Joseph Cardinal Bernardin. It was the Jubilee Mass of Thanksgiving commemorating the 75th Anniversary of the founding of the parish. The men and women in the procession were some of the original pioneering families, including 93 year-old Mary Walley and 91 year-old Pearl Wesol Hunter. The Mass was the highpoint in a year-long celebration of a triumphant milestone in the procession of years. Reverend Joseph Kinane was appointed by Cardinal Bernardin in 1983 and soon after his arrival, a parish census was taken. The number of families in the parish was about 2,300. Under Father Joe's leadership, the parish's potential for Lay involvement, already begun in the 1970's, was more fully developed. With his encouragement and direction, the parish added masses to the Sunday schedule as well as several new ministries, including the Social Services Ministry, the Parish Nurse's Office and the Contemporary Choir. By 1996, the parish had grown to 3,500 families. Reverend Kinane became Pastor Emeritus when he retired in 1996.